The idea of constructing a research park on the hills next to NTT Yokosuka Electrical Communication Laboratory (Present NTT Yokosuka R&D Center) was promoted by the following 3 bodies: Ministry of Post and Telecommunications (Present Ministry of Internal Affairs and Communications), Yokosuka City, and Keikyu Corporation. 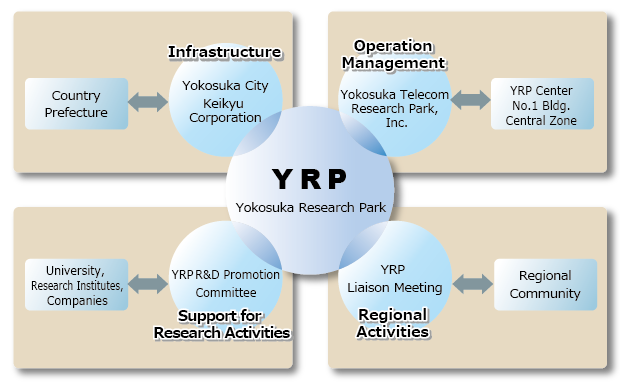 Since its start, Yokosuka City and Keikyu Corporation have been in charge of developing the land and infrastructure; Yokosuka Telecom Research Park Inc., a third-sector (semi-public) company established by Yokosuka City and other investors, administrates YRP’s core facility, YRP Center No. 1 Building; YRP R&D Promotion Committee handles drawing up whole YRP plan and promotion of R&D activities in cooperation with the Ministry of Internal Affairs and Communications and Yokosuka City. Meanwhile, YRP Liaison Committee is organized to support regional exchange. YRP R&D Promotion Committee (*2) Drawing up of YRP Plan to form a research park for advanced information societies of the 21st century. Selling of land for laboratories, Management of YRP Center No.2, No.3, No.5 Bldgs, YRP venture building, restaurants, etc. YRP Center No. 1 Bldg: Yokosuka Telecom Research Park, Inc. Owner of YRP's core facility, YRP Center No.1 Bldg. In charge of management and operation of YRP, and leasing office and labs, meeting rooms, etc. Operating R&D facilities and providing training courses. Support for Research Activities: YRP R&D Promotion Committee Planning and coordinating collaborative research, events, symposia, and seminars. Support for Participating Companies: YRP R&D Promotion Committee Working on studies and publications to invite new companies, and screening of newly-participating companies. Promotion of Regional Activities: YRP Liaison Committee Information Exchange for the improvement of working environment, Organization of recreation events for YRP participating companies and neighboring residents.